A police website has been hacked, leading to the publication of what appear to be login details and passwords for dozens of officers. Hertfordshire Police said information stored on an externally hosted database had been published on the internet. The data, including phone numbers and IP addresses, relates to a number of officers in Safer Neighbourhood Teams. Part of the force's website has been taken down as a "precaution" while investigations continue. 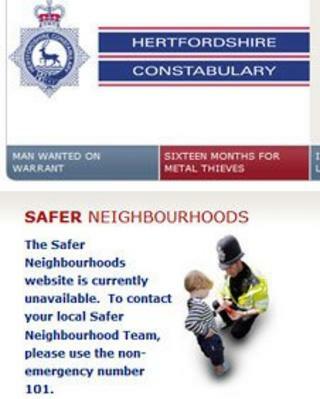 In a statement, the force said: "Hertfordshire Constabulary is currently investigating following the publication on the internet of information stored on a database linked to the public Safer Neighbourhoods pages of the external Constabulary website. "As a precaution these pages have been temporarily disabled whilst the circumstances as to how this information was obtained is investigated. "There is absolutely no suggestion that any personal data relating to officers or members of the public has been, or could have been compromised. "Nevertheless matters of IT security are extremely important to the Constabulary and an investigation is already under way." The hacker added an "OpFreeAssange" banner to the details posted online, and also added a quote from the Wikileaks founder, Julian Assange. There have been a number of hacking attacks since the UK government said it would arrest and extradite Mr Assange if he left Ecuador's embassy in London. However, the hacker in this case distinguished himself from other attacks by writing "I am not a member of Anonymous" - a reference to the hacktivist group that has claimed responsibility for other actions.